This tall and slender tote would happily hold a bottle and some snacks for a little picnic. The leather handles are amazingly soft. 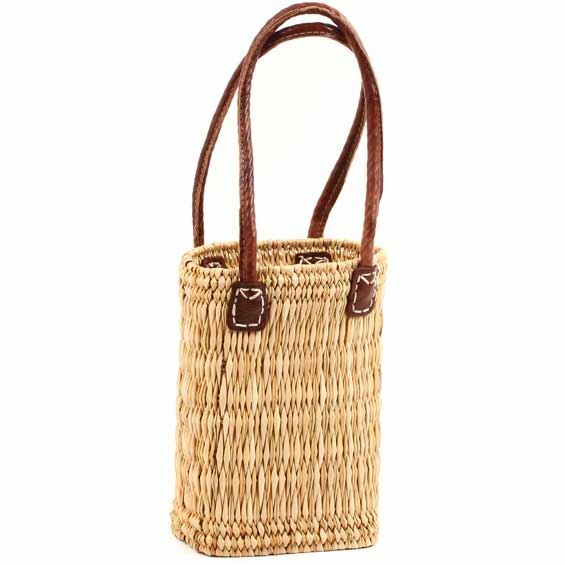 You will receive a tall, slender tote basket nearly identical to the one pictured above, but please keep in mind that each one is hand-woven and varies slightly in design and color. The leather on the handles is soft, and adds to the durability. These totes come from the coastal area of Central Morocco, where the bulrush plants are plentiful. Rectangular pieces are loom-woven and then stitched together to create these useful baskets.